LCV: Does Roy Blunt Believe in America? VIDEO: "America's Youth is Getting Angry"
A few weeks ago, I wrote about Intel Oregon’s outstanding corporate greenwashing efforts, through which the company has sought to maintain a green, eco-friendly image in my home state even while lending its membership and influence to industry associations intent on sinking state-level global warming policy. In the short time since that post was published, much more has happened. For one thing, Intel’s national-level version was, for the second year running, awarded 1st place on the EPA Green Power Partnership’s “Top 50” list of purchasers of renewable energy. One point that emerged was that the very fact that Intel is the nation’s number one purchaser of renewable power, and yet still covers less than half of their power with renewable sources, underscores the truly massive amounts of energy this company consumes. Several finalists on the “Top 50” purchased a much higher percentage of their energy use from renewables than Intel, but couldn’t compete simply because Intel’s energy consumption is so great. This doesn’t mean that Intel doesn’t have the best of intentions when it purchases renewable energy credits. But it does go to show that placement on the “Top 50” list isn’t everything. In Oregon, the home of Intel’s largest state-level branch, the company’s massive energy bill has ensured it a place in Industrial Customers of Northwest Utilities (ICNU) – an industry association that, as I explained in my post from a few weeks ago, is heavily involved in fighting global warming policy in this state. Since my last post on the subject, ICNU and its allies have scored a major victory: the idea of a carbon cap has been stripped from Oregon’s Senate Bill 80, rendering the carbon cap concept essentially dead in Oregon this year. This happened less than a month after the Cascade Climate Network challenged Intel’s Government Affairs Manager to lobby with us in support of a carbon cap. Intel turned down that challenge, and kept quiet on the cap all during the time the idea was being debated in the legislature. It’s not unrealistic to think that vocal support from Intel – the largest private employer in Oregon – could have made all the difference to the cap’s survival in Oregon. But Intel chose not to get involved, which by default meant letting industry groups like ICNU speak for it. It’s great that Intel is purchasing green power. However, the company’s huge energy bills guarantee that it will be involved in state politics which affect (or which Intel believes could affect) corporations’ access to cheap energy. In Oregon, the results of Intel’s political involvement have not been positive; if you factor in the credibility that the company lends to industry groups opposed to global warming policy, Intel is doing far more harm than good this legislative session. Can Intel be excused on the basis that they’re devoting all their green efforts to practices like purchasing green power, rather than state-level lobbying efforts? The answer is no, because the choice is a false dichotomy. By and large, the people making decisions about Intel’s energy purchases are not even the same individuals deciding what state-level bills the company will or will not support. Paul Otellini, President and CEO of Intel, is a busy guy: he almost certainly was not even consulted when the Oregon branch of his company formed its position on Senate Bill 80. Otellini says of Intel, “Our renewable purchase is just one part of a multi-faceted approach to protect the environment, and one that we hope spurs additional development and demand for renewable energy.” Well, a truly multi-faceted approach to environmental issues should include, if not active efforts to promote state policies that curb pollution, at least withdrawal from industry groups that work to discourage such policies. Maybe it's time Paul Otellini checked up on what his company is actually doing in Oregon. Jesse Jenkins and I have a new article published at Yale Environment 360 with the Brookings Institution today arguing for major federal investments in a new energy innovation system, based on a recent proposal by Brookings' Metropolitan Policy Project, which included contributions from the Breakthrough Institute and cited our previous report, "Fast, Clean, & Cheap." Note: Jesse Jenkins and David Warren also co-authored this article, but due to editorial requirements are mentioned as contributors. Energy Secretary Steven Chu recently called for "Nobel-level" breakthroughs and a "second industrial revolution" in energy technology to overcome the world's interlinked energy and climate challenges. Chu's implication: We currently lack the technologies we need to fully avert catastrophic global warming. His admonition: America must dramatically accelerate the development of clean energy technology. The task is clear: To renew the U.S. economy, respond to global climate change, foster the nation's energy security, and help provide the energy necessary to sustainably power global development, America must transform its outdated energy policy. Innovation and its commercialization must move to the center of energy system reform. The nation must move urgently to develop and harness a portfolio of clean energy sources that are affordable enough to deploy on a mass scale throughout the U.S. and the world. In short, we must make clean energy cheap. Putting a price on carbon will take us part of the way, but not nearly far enough. To make the revolutionary shift to a low-carbon economy, we propose a bold new research paradigm: the creation, over time, of several dozen renewable energy research hubs around the nation. These centers -- known as energy discovery-innovation institutes, or e-DIIs -- would be established with a combination of federal, state, university, and private funds and would take the lead in accelerating the development of reasonably priced alternative energy technologies and bringing them to the marketplace. The Brookings Institution's Metropolitan Policy Program -- joined by a number of leading universities, regional alliances, and corporate partners -- has laid out a detailed plan for launching a network of energy innovation institutes around the country. In the Southwest, the institutes might focus on advancing solar technologies. Centers in the Great Lakes region might speed development of advanced battery technology or hydrogen fuel cells. Energy innovation institutes in the Great Plains might focus on developing sustainable, non-food sources of biofuels. Individual energy innovation institutes would vary not only by theme but also size, with some centers operating with budgets as small as $10 million to $15 million per year, while others -- the most successful and ambitious -- might see their budgets grow to as large as $100 million to $200 million a year, making them as robust as large academic medical centers. Those energy research institutes that "delivered the goods" in terms of clean energy breakthroughs within 5 to 10 years would grow; those that did not, would die. Ultimately, total federal investment in the energy research institutes could grow to $6 billion per year. Such an ambitious plan is needed to meet the enormous challenges we face: Over the next four decades, global energy demand is expected to triple. At the same time, global greenhouse gas emissions must fall rapidly, decreasing at least 50 to 85 percent by mid-century to avert disruptive climate change. Most of the growth in energy demand will occur in the developing world, as nations like China, India, and Brazil continue to lift their citizens out of poverty and build modern societies. Overall, that's a very good thing: Increased access to energy brings electricity to pump and treat potable water, lights to read and study by, access to modern health care, relief from backbreaking physical labor, and much more. The problem, however, is that fossil fuels remain cheap and abundant. That means that in the absence of similarly affordable and large-scale clean energy sources, the nations of the developing world will turn to coal and other fossil fuels to power their development, just as we in the United States have done. And that would virtually assure massive climatic destabilization, regardless of what occurs in the developed nations of the world. Hence the dominant climate policy agenda of our time: Captivated by market logic and sophisticated regulatory schemes, mainstream climate policy advocates have focused above all on utilizing market-based mechanisms and price signals -- such as carbon taxes and cap-and-trade plans -- to make dirty energy more expensive. According to this approach, the resulting price signals would spur private-sector investment and innovation in clean energy alternatives and secure the energy technology transformation we need. But there is one complication: Policymakers and the public alike are reluctant to increase the price of energy significantly through higher prices on carbon emissions. At a time of deep economic recession, public tolerance for higher energy prices wanes. In the developing world, the message is even clearer, summed up by one Chinese official, Lu Xuedu, of the Office of Global Environmental Affairs. "You cannot tell people who are struggling to earn enough to eat that they need to reduce their emissions," declared Lu. None of which means that putting a price on carbon is a bad idea. Internalizing the many costs of burning dirty fuels is long overdue. But in the midst of a recession, any carbon-pricing scheme the current Congress manages to enact will likely price carbon at levels far below those needed to adequately stimulate rapid deployment of clean energy technologies. Moreover, price signals alone can only do some of the work, because even ambitious pricing will not fully address the many non-price-related market failures standing in the way of a cleaner and more efficient energy system. Nowhere is this clearer than in the innovation game. Private energy firms chronically under-invest in energy R&D because they cannot fully capture the future returns of their innovations, which spill over to their competitors. And in contrast to the consumer electronics, pharmaceutical, and computer industries, too few early adopters in the energy-sector are willing to pay five times more to own the latest, greatest gadget, which means that emerging energy technologies must become competitive much more quickly to survive. That makes private companies reluctant to make bets on new clean energy technologies. The energy industry remains one of the least research-intensive industries in the economy. The upshot: private-sector investment in energy R&D will almost certainly proceed more slowly than the climate challenge demands. Which bring us to the crux of the matter: If we can't rely solely on market signals to make clean energy cheap, the national government must play a more active role. Once again, as it did in laying down the railroads and highways and stimulating the electronics and biotech explosions, the federal government must make significant investments in activities and infrastructure. This includes supervising the construction of a modern, nationwide smart grid that will open the way for private investments in new energy sources by allowing the flexible distribution of renewable power. The government must also make direct investments to support the deployment of emerging clean energy technologies, driving economies of scale, and bringing down prices. And, finally, the government must increase the federal R&D budget by an order of magnitude while deploying some of its investments in radically new ways. Current federal spending on non-defense, energy R&D remains far too small. The current outlay of about $4 billion is less than half of the amount spent, in real dollars, in 1980. New infusions in the recent economic stimulus package will boost the current figure, as will an additional $15 billion a year to be set aside for clean-tech investments from the cap-trade system projected by President Obama's recent budget outline. Still, such investments will likely come in below the $20 billion to $30 billion per year in federal clean energy R&D that many analysts believe is needed to address the climate and security threats posed by the nation's fossil fuel dependence. At the same time, federal energy research remains outdated and fragmented. To begin with, the U.S. Department of Energy (DOE) really isn't even in the energy innovation business. The bulk of the department's funding and operational competence remaining focused on managing -- and cleaning up after -- the nation's sprawling nuclear weapons system. Otherwise, what energy research efforts do exist within DOE remain insular, focused largely on weapons development, and generally organized around an "energy technology of the year," instead of the integrated approach demanded by the nation's complex array of energy challenges. The bulk of DOE's research activities -- despite excellence in certain areas -- remain too removed from the marketplace to quickly develop and commercialize clean energy innovations. To fully mobilize the entire national research enterprise -- universities, federal laboratories, and corporate R&D centers -- the nation needs to begin creating a network of energy innovation institutes. Developed by the National Academy of Engineering, the energy innovation concept is characterized by institutional partnerships, interdisciplinary research, technology commercialization, education, and outreach. The institutes would place a high priority on collaboration, commercialization, and performance. What sort of research would likely be conducted at the energy innovation institutes? One or two would surely mount an aggressive push on new materials and designs for low-cost solar panels. Others might lead the charge on the development of massive, cost-effective energy storage; new battery chemistry that will lead to truly viable electric vehicles; better plant growth and biotechnology conversion to provide affordable biofuels; superconductive transmission lines for efficient electrical power distribution; new techniques for sequestering carbon or even capturing it from the air; and much more. The institutes would be geared toward rapid technology transfer designed to maximize the economic and social impact of new renewable technologies. Breakthrough inventions could be protected by intellectual property laws. Depending on the region, energy innovation institutes could take shape at university campuses, through national labs, at other institutes, or even virtually. A competitive awards process would seek to target the best proposals from wherever they originate. And the regional nature of the centers is key: the institutes would draw on local workforces, scientists, businesses, and other resources to rapidly deploy new technologies that respond to local challenges and stimulate local economic development. Successful examples of effective, practical collaboration among universities, government, and industry already exist. One such enterprise is the Energy Biosciences Institute, a renewable energy research group involving the University of California at Berkeley, the University of Illinois at Urbana-Champaign, Lawrence Berkeley National Laboratory, and the oil giant, BP. In important ways, the energy innovation institute concept represents a contemporary adaptation of the research paradigm created through the land-grant acts passed by Congress in the 19th century. Then, federal investments established a network of university-based agricultural and engineering experiment stations, augmented by extension services capable of interacting directly with the marketplace. That program was instrumental in developing and deploying the technologies necessary to build a modern industrial nation for the 20th century, while stimulating local economic growth. Today, the U.S. needs a similarly bold campaign to enlist America's universities, laboratories, and companies in solving one of the most complex and important problems -- the transition to a clean-energy economy -- that the nation has ever faced. David Warren, a research analyst at the Brookings Institution, and Jesse Jenkins, director of energy and climate policy at the Breakthrough Institute, also contributed to this article. The 'interwebs' are abuzz today with the surprise announcement that moderate Republican Senator Arlen Specter of Pennsylvania is switching parties and plans to run as a Democrat when he makes his 2010 re-election bid. The move is clearly a powerful symbol of how far to the right the Republican Party has moved in recent years. What it means for policy is less clear. Senator Specter's membership in the Democrat ranks would nominally give the party the sixty votes necessary to overcome the near-constant threat of Republican filibuster in the Senate (assuming Democrat Al Franken wins the contested court battle that will decide Minnesota's senate seat). That has prompted a sudden burst of optimism about the prospects of contentious Democratic policy priorities, including health care reform and climate change legislation. ClimateProgress's Joe Romm blithely asserts, for example, that Senator Specter's new party allegiance will mean he'll change his stance on climate legislation. "One assumes that if he is going to seriously run as a Democrat, he'll support an energy and climate bill," Romm wrote today. More astute observers, however, quickly recognize that Senator Specter's move changes little in the landscape of climate politics. For serious advocates of urgently needed and effective climate legislation, it's not hard to see why. We simply have to ask ourselves: does the "D" next to this free-thinking Senator's name suddenly change his vote on climate legislation? Of course not. Senator Specter was clear today that he "will not be an automatic 60th vote for cloture." "My change in party affiliation does not mean that I will be a party-line voter any more for the Democrats that I have been for the Republicans," the Senator said at his press announcement this morning. And as he left the podium today at a press conference that aired on MSNBC, Specter answered a question about climate policy by saying his views on a climate bill are unchanged. The reality is, Senator Specter has always been (and still remains) a crucial swing vote necessary to get to any climate bill to the critical 60-vote threshold in the Senate. The challenge ahead for climate advocates remains clear and the same today as it was yesterday: we urgently need a proactive strategy to address the substantive concerns of moderate 'Heartland' Democratic Senators (who's ranks are now one vote larger) and forge a new path forward to consensus on effective climate policy [see "The Sherrod Brown Test" for more on what that will take]. Like the other moderate Democrats he now joins, Senator Specter has long voiced concerns that climate legislation, if done poorly, would damage the already fragile manufacturing-based economy of Pennsylvania. He voiced support for action on climate change and even authored a bill with Senator Jeff Bingaman (D-NM). However, Senator Specter's support for climate policy has always required explicit and transparent cost containment provisions to limit the price of carbon and the impacts on his states' energy prices. Senator Specter voted against the McCain-Lieberman climate bill twice in the past and helped deny an up-or-down vote on the Lieberman-Warner Climate Security Act last summer (effectively killing the legislation). Democrat or Republican, Senator Specter remains an independent thinker and a difficult but critical swing vote on climate legislation. It will be no easier to meet his concerns than it will the other critical swing Democrats in the Senate. But his announcement today makes it all the more critical that climate advocates proactively work to craft legislation that meets the concerns of moderates like Specter while retaining the capacity to effectively drive the rapid transition to a clean and prosperous energy economy. We've been working on precisely that challenge for years here at the Breakthrough Institute, and we remain committed to working with Senator Specter (and the rest of his new colleagues in the Democratic Party) to find climate solutions that minimize impacts on Pennsylvania and the manufacturing Heartland of America, create a prosperous clean energy economy, and invest in the new clean energy technologies and industries of the future. "The Sherrod Brown Test: Finding Consensus on Climate Policy"
"The Cap and Trade We Need"
"The Challenge Ahead: More than a Third of Senate Now "Swing" Vote on Climate"
"Technology Ten Grows to Sixteen Members, Set to Take Charge of Climate Legislation in 2009"
"Who Killed Cap and Trade"
Last summer we developed a proposal for a National Energy Education Act (NEEA) to launch a major new federal initiative supporting clean energy-related education, in collaboration with our Breakthrough Generation Fellows. We published the proposal in two newspaper op-eds, including the SF Chronicle and Baltimore Sun, and it was later featured in Mother Jones magazine, congressional testimony, and online interview. We also submitted a fact sheet and strategy brief to the Obama campaign and called upon young people to advocate for NEEA. "There will be no single Sputnik moment for this generation's challenges to break our dependence on fossil fuels... But energy is our great project, this generation's great project... the Department of Energy and the National Science Foundation will be launching a joint initiative to inspire tens of thousands of American students to pursue these very same careers, particularly in clean energy. It will support an educational campaign to capture the imagination of young people who can help us meet the energy challenge... And it will support fellowships and interdisciplinary graduate programs and partnerships between academic institutions and innovative companies to prepare a generation of Americans to meet this generational challenge." "It is imperative that we transform our nation’s universities, colleges and vocational schools into multidisciplinary hubs of clean energy innovation… Today, a National Energy Education Act would equip a new generation of Americans with the highest-caliber human capital, inspire them to tackle energy as their generational undertaking, and pave the way for new industries and technologies that will drive the U.S. economy for decades to come." "In the 1950s and 1960s, Sputnik and the space race inspired young people to pursue careers in science and engineering... President Obama believes that we have a similar opportunity to inspire today's young people to tackle the single most important challenge of their generation - the need to develop cheap, abundant, clean energy and accelerate the transition to a low carbon economy. Based on this overview, it appears that Obama's initiative shares many similarities with our NEEA proposal (see below). First, as we suggested, it will be overseen by the Department of Energy and National Science Foundation. Second, it will focus primarily on institutions of higher education, supporting undergrads, graduate students, and students at technical and vocational schools. Third, it will support interdisciplinary curriculum development, teacher training, and career development. Finally, it will promote important collaboration between private industry and colleges. Today, the White House also announced the launch of the new Advanced Research Projects Agency (ARPA-E) and Energy Frontier Research Centers (EFRC) program. ARPA-E has been granted $400 million from the 2009 stimulus package, and the White House has committed to investing $777 million in EFRC over the next five years. Both will support basic and applied R&D, particularly at universities and national laboratories, but also at nonprofits and private firms. This meets NEEA's recommendation for greater energy R&D at universities and is a first step toward the $15 billion per year for clean energy R&D Obama has consistently promised. More details are necessary to provide a comprehensive review, but based on our initial read, RE-ENERGYSE looks like an excellent start for new energy education. However, we encourage the Obama administration to ensure it receives the resources necessary to have a substantial impact. Given the scale and urgency of the energy challenge, we recommend an initiative on par with the National Defense Education Act, which required approximately $5-7 billion over five years (adjusted for inflation). We also encourage the administration to coordinate ENERGYSE with ARPA-E, EFRC, and other university-related energy research initiatives at the Department of Energy, to ensure optimal synergy. Finally, we encourage President Obama and his administration to focus ENERGYSE primarily on inspiring and training young people to make clean energy cheap -- to pioneer the innovations that will drive down the price of clean energy technologies as rapidly as possible. As we recently argued, this is the single most important factor for overcoming our climate and energy challenges, both in the U.S. and abroad, and it needs to be the focus for our rising energy innovators. Our generation is ready. As two members of the millennial generation and leaders in the youth energy and climate movement, we have seen a hunger for an inspirational vision and purpose for our nation as well as our education and careers. President Obama took a critical step today in providing that vision and purpose -- now he simply needs to provide the resources to make it happen. The United States will restore its standing as the most innovative nation in the world, President Obama declared at a major speech on science, innovation, and education policy delivered today at the National Academies of Science in Washington D.C. The President pledged to implement policies that will dramatically ramp up the United States' overall spending (both public and private) on innovation and R&D, bringing it up to three percent of the nation's total economic output (GDP). President Obama also declared that it was his goal to see the nation once again have the highest percentage of college graduates in the world by 2020. The stimulus bill's $21.5 billion investment in science and technology was the largest investment in R&D in the nation's history, Obama said. He promised that his administration would build on these investments by continuing to expand budgets for key agencies funding science and research (DOE, NSF, NIST), making permanent the federal R&D tax credit to encourage private-sector investment in innovation, and launching a major increase in funding to support the transformative innovation necessary to overcome the nation's energy and climate challenges. "At such a difficult moment, there are those who say we cannot afford to invest in science. That support for research is somehow a luxury at a moment defined by necessities. I fundamentally disagree. Science is more essential for our prosperity, our security, our health, our environment, and our quality of life than it has ever been. And if there was ever a day that reminded us of our shared stake in science and research, it's today. President Obama once again pledged to increase public investment in clean energy innovation by an order of magnitude, promising $15 billion in additional annual spending to support energy R&D, and highlighted the role innovation must play in overcoming the nation's urgent energy and climate challenges. "[ARPA-E] is based on the Defense Advanced Research Projects Agency, known as Darpa, which was created during the Eisenhower administration in response to Sputnik. It has been charged throughout its history with conducting high-risk, high-reward research. The precursor to the Internet, known as Arpanet, stealth technology, and the Global Positioning System all owe a debt to the work of Darpa. ARPA-E seeks to do this same kind of high-risk, high-reward research." The fact is, there will be no single Sputnik moment for this generation's challenge to break our dependence on fossil fuels. In many ways, this makes the challenge even tougher to solve -- and makes it all the more important to keep our eyes fixed on the work ahead. That is why I have set as a goal for our nation that we will reduce our carbon pollution by more than 80 percent by 2050. And that is why I am pursuing, in concert with Congress, the policies that will help us meet this goal. My recovery plan provides the incentives to double our nation's capacity to generate renewable energy over the next few years -- extending the production tax credit, providing loan guarantees, and offering grants to spur investment. For example, federally funded research and development has dropped the cost of solar panels by ten-fold over the last three decades. Our renewed efforts will ensure that solar and other clean energy technologies will be competitive. Still, while we face no clear starting shot, a new Sputnik Moment is upon us nonetheless. Towards the end of President Obama's speech, as he talks about the importance of education and the critical role young innovators and entrepreneurs must play in both securing our nation's prosperity and solving pressing energy challenges, President Obama strongly parallels both the tone and substance of the Breakthrough Institute's call for a National Energy Education Act. President Obama announced today the creation of a new joint initiative at the Department of Energy and National Science Foundation "to inspire tens of thousands of American students to pursue careers in science, engineering and entrepreneurship related to clean energy." "[This initiative] will support an educational campaign to capture the imagination of young people who can help us meet the energy challenge. It will create research opportunities for undergraduates and educational opportunities for women and minorities who too often have been underrepresented in scientific and technological fields -- but are no less capable of inventing the solutions that will help us grow our economy and save our planet. And it will support fellowships, interdisciplinary graduate programs, and partnerships between academic institutions and innovative companies to prepare a generation of Americans to meet this generational challenge. Major increase in public funding for energy innovation. And of course, a crucial national 'call to service' for a new generation of scientists, innovators and entrepreneurs that will inspire and rally my young generation to see this as their life's work. As Teryn and I have written, for the budding scientists, researchers, innovators, entrepreneurs and engineers of our young generation, if we want to save the world, we need to make clean energy cheap, and invent the energy technologies that will form the backbone of a clean and prosperous 21st century economy. The energy innovation imperative is clear and urgent. Yet as President Obama recognizes, the new generation of innovative Americans we need will not emerge without the proper inspiration and the proper support from our nation's government. "For we must always remember that somewhere in America there's an entrepreneur seeking a loan to start a business that could transform an industry -- but she hasn't secured it yet. There's a researcher with an idea for an experiment that might offer a new cancer treatment -- but he hasn't found the funding yet. There is a child with an inquisitive mind staring up at the night sky. Maybe she has the potential to change our world -- but she just doesn't know it yet. As you know, scientific discovery takes far more than the occasional flash of brilliance -- as important as that can be. Usually, it takes time, hard work, patience; it takes training; often, it requires the support of a nation. But it holds a promise like no other area of human endeavor." Well said (as usual), Mr. President. For those interested in the full speech, the New York Times' Andy Revkin has begun an annotated version of the full speech at his blog, Dot Earth here. You can also read a fact sheet accompanying the President's speech and summarizing the policy initiatives discussed today here. Newt Gingrich appeared before the House Energy Subcommittee today to testify on climate legislation being considered in the House. It was an odd testimony and Q&A, during which the former Republican Speaker of the House (and former supporter of climate action) repeatedly ranted about a provision in the bill that would empower the Department of Energy to set energy efficiency standards for "portable spa units" - aka jacuzzis. Apparently Gingrich considers this effort to ensure that energy-intensive luxury appliances are more efficient a devastating assault on personal freedom. What's probably most interesting about this rant though, is that Gingrich seemed to have no idea that the section was about energy efficiency standards, and not about the cap and trade regulations on greenhouse gas emissions that are at the heart of the bill and seemed to be the intended target of Gingrich's ire. Well that's less of a surprise when you note that Gingrich inadvertently admitted to not having read the cap and trade provisions in the legislation AT ALL. As he began his testimony, Gingrich preemptively responded to the question Oregon Representative Greg Walden (R) had repeatedly asked of all witnesses appearing before the committee, "Have you actually read all of this bill?" Gingrich told the panel, "I did begin reading the draft bill, but to be candid, stopped at about page 236" when he got to the apparently offensive section about jacuzzi efficiency standards. That's notable, because if you're an avid climate wonk like me and have actually read most of the draft bill, you know that the cap and trade title of the legislation begins long after page 236 and the energy efficiency title. The "Reducing Global Warming Pollution" title of the bill (Title III) actually starts on page 322, which Gingrich didn't even skim apparently. Maybe next time, Mr. Gingrich, you should actually read (or at least look at) the parts of the bill you are so sure are going to wreck the American economy. 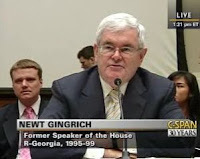 You can watch Gingrich at CSPAN's archives here. He slips up at about 2 minutes in and admits to stopping short of the Global Warming Title. Student activists who favor global warming legislation are accusing former House Speaker Newt Gingrich of changing his position in anticipation of his testimony today before House Energy and Commerce Committee. Nazdin is a chief organizer with the Energy Action Coalition, which is staging a rally outside of the Rayburn House Office Building. Dressed in bright green shirts, hard hats and placards the youth activists hope to publicize Gingrich’s ties to the coal industry. In April 2008 Gingrich promoted national action against global warming in concert with House Speaker Nancy Pelosi (D-Calif.). The student energy coalition claims he has now changed his position after his organization accepted donations from coal interests. Here's the 2008 video mentioned in the story, from an advertisement sponsored by the Alliance for Climate Protection's We Campaign. So what happened to that Can Do American spirit that Newt seemed to embrace back int the day (i.e. just 12 months ago!)? Appearing at today's hearing (check out the hash tag #powershift09 on Twitter for live coverage and commentary of the hearing), the former Speaker of the House was all "we can't do it, we don't have the technology, it'll cost to much," etc. Yes We Can gave way to No, No, No. [I]n July , [Gingrich's] 527 group, American Solutions for Winning the Future, received a quarter-million dollars from Peabody Coal and hundreds of thousands more from coal and oil companies. By late August, the 527 group had launched its deceptive, anti-environmental, pro-dirty energy “Drill Here. Drill Now. Pay Less.” campaign. Gingrich has been a paid shill for the oil companies which, while already making record profits, want more of the status quo. Both the oil companies and Gingrich want us to stay dependent on oil. Of course they do. ExxonMobil is the most profitable company in the world according to the most recent Fortune 500 list. If there's anyone who proves time may not necessarily heal all wounds, it's Newt. Nearly a decade after he resigned from the House with an approval rating of just 28 percent, a 2007 poll showed remarkable 54 percent of Americans still held an unfavorable opinion of Gingrich. Cheney was only slightly less popular, rated unfavorably by 57 percent of those polled. Yesterday, was the 39th anniversary of Earth Day and to mark the occasion, President Obama was in Newton, Iowa to speak about clean energy. Newton is one of those towns where most of the residents are employed by one major employer, and until October 2007, that employer was Maytag. So when Whirlpool bought Maytag and shut down the Newton plant, over 12% of Newton's 16,000 residents lost their jobs. If you didn't lose a job, your husband, sister, or neighbor surely did. But now Newton's a shining example of what's possible. Instead of dishwashers and washing machines, the people of Newton are making wind turbines. That's why President Obama chose Newton and Trinity Structural Towers to argue that "the choice we face is not between saving our environment and saving our economy. The choice we face is between prosperity and decline." But towns like Newton aren't just losing jobs, they are losing talent too. Young people have been hit hard by this recession. According to the Education and Labor Committee, of the 1.2 million jobs lost last year, 60 percent were held by workers under the age of 25. Mobile and in search of opportunity they are moving to bigger cities and mega regions that promise greater opportunity. Iowa, in particular, has been hurt by this "brain drain," losing more college graduates than any other state in the country. So while we replace dishwashers with wind turbines, and re-open empty auto manufacturing plants with solar manufacturing facilities, let's also work to build truly whole communities. The communities that define themselves by one industry or one employer will be increasingly at risk. A healthy, 21st century economy demands that we become increasingly self-sufficient in the resources we use---the food we grow, the water and energy we consume, and the products we build. Revitalizing local living economies can create jobs, conserve energy, and keep young talent in the community. Senators who usually couldn't be farther apart on environmental issues agreed on Earth Day that the EPA should look at ways to control a dangerous pollutant that kills millions worldwide and accelerates global warming, particularly in the Arctic: soot, also known as the sinister-sounding "black carbon." Two of the Senate's greenest members, John Kerry of Massachusetts and Barbara Boxer of California, and Jim Inhofe, the Oklahoma Republican who is the Senate’s chief global warming skeptic, introduced a bill requiring the EPA to study black carbon pollution and within a year come up with solutions for reducing emissions. Earthjustice has just released a short animated film that explains the black carbon problem and urges EPA Administrator Lisa Jackson to take action. The video also asks Americans to urge Secretary of State Hillary Clinton’s team to take international leadership on black carbon at next week’s Arctic Council meeting in Tromso, Norway. The video can be viewed below and at www.stopsoot.org. Black carbon consists of microscopic airborne particles of soot from diesel engines and industrial smokestacks in the developed world and residential cooking and heating stoves in the developing world. Breathing black carbon causes serious respiratory illness responsible for 1.6 million deaths a year, and when it falls on ice or snow in the Arctic, it causes it to melt faster. Since black carbon stays in the atmosphere only a short time, fast action to control it will buy time for addressing the larger issue of carbon dioxide, the chief cause of global warming. "The science emphatically proves that black carbon has a larger impact on climate change than was previously understood and we can’t escape reality," Sen. Kerry said in a press release. In Earthjustice's view, the bill is a welcome first step, but we must do more. It’s important that we continue reducing black carbon emissions at home, and help developing countries transition to cleaner fuels, engines, and cookstoves. For advocates of immediate and strong climate and clean energy legislation, there's one man we should all be paying close attention to: Senator Sherrod Brown (D-OH). Senator Brown is one of several Democratic Senators from America's 'Heartland' states that form the critical swing block of legislators that will need to support any climate and clean energy bill that hopes to cross the critical 60-vote threshold in the Senate. Along with a small handful of potential Republican swing votes, these Heartland Democrats have to get behind strong climate policy if we want to see it enacted anytime soon. "If we care about the world in which we live and the generations that will follow us, then we must no longer dismiss the lethal risks global warming poses to our planet. We must craft an aggressive strategy to combat global warming, and we must do it now. ... Inaction is not an option." And yet, the Senator has not pledged support for a specific climate policy. He was among 10 Democratic Senators who signed a letter (pdf) last June, saying they couldn't support climate legislation that resembled the Lieberman-Warner Climate Security Act, which had just been defeated on the Senate floor. That group now includes five more Democratic Senators, and other Democrats have joined a group led by Senator Evan Bayh of Indiana to stake their claim on climate policy as well. Senator Brown is still on the fence, and as the old saying goes, 'the devil is truly in the details:' if the details of climate and clean energy legislation make it something Senator Brown can support and even champion, then there's a decent shot of seeing the remaining swing Senators jump on board, putting 60 votes within reach. On the other hand, if Senator Brown can't support the proposal because he's not convinced it's in the best interests of Ohio or the nation, then kiss hopes of climate action this year good bye. It's simple: if we want to pass policies that will truly catapult the United States into a clean and prosperous energy economy, slash global warming pollution, and make clean energy cheap and abundant, we need to pass the "Sherrod Brown Test." First, passing the Sherrod Brown Test requires minimizing the economic costs of higher energy prices and maximizing the economic benefits of the legislation, particularly for the manufacturing sector. Senator Brown is a progressive champion of the manufacturing industries and union jobs that employ so many of his state's residents in good-paying middle-class jobs. Energy-intensive manufacturing industries are sensitive to the price of energy inputs and these industries, already hard hit by the recession, are even more at risk if energy prices rise too much. Climate legislation premised on a significant increase in dirty energy prices will therefore have a very hard time passing the Sherrod Brown Test. Measures to keep the costs of carbon - and therefore Ohio electricity rates - from rising too high are likely a necessity, and the more transparent they are, the more likely they will be to assure Senator Brown that the worst-case scenarios drummed up by fossil fuel lobbyists, right wing think tanks, and other forces of the status quo aren't going to materialize. "Across my state, manufacturing towns such as Toledo, Cleveland, Dayton, Youngstown and Columbus are leading the way in advanced manufacturing for new clean energy technologies. Our state and our nation need this boost in manufacturing, because in important ways, manufacturing jobs anchor our nation's middle class." To pass this part of the test, the revenues raised by climate legislation should be reinvested to spur the birth of a prosperous clean energy economy, including new manufacturing jobs in revitalized industrial sectors. In particular, we should focus on investments to accelerate the development and deployment of new clean energy technologies and ensure the industries and jobs of tomorrow take root here in America. Second, passing the Sherrod Brown Test requires major public investments in clean energy R&D and the deployment of emerging clean technologies - both designed to make clean energy cheap and affordable. "[Climate Legislation Must] Invest Aggressively in New Technologies and Deployment of Existing Technologies. There is no doubt that we need a technological revolution to enter into a low carbon economy. It is critical that we design effective mechanisms to augment and accelerate government-sponsored R&D programs and incentives that will motivate rapid deployment of those technologies..."
Yes, they clearly have in mind carbon capture and storage (CCS) technology that could enable these coal-reliant states to continue burning the fossil fuel without damaging the climate. But they also envision low-cost solar panel technologies built in Akron or Youngstown, a new generation of biofuels made from agricultural residues and forestry wastes in rural Arkansas and Missouri, and affordable and efficient plug-in hybrid cars rolling off assembly lines in Ann Arbor and Detroit. Not only are investments in these new clean energy technologies welcome boons to the economies of Heartland states, they are also essential to make clean energy cheap and affordable. Both a step-change increase in the scale of federal energy R&D and the accelerated deployment of emerging technologies to capture economies of scale are critical to lowering the real, unsubsidized costs of clean energy technologies. Making clean energy cheap is a necessary objective of any climate policy in order to secure an affordable and reliable supply of energy to power a prosperous American clean energy economy. Third, passing the Sherrod Brown Test requires reassuring the Senator that climate policies will not disproportionately impact Ohio and similar states. Senator Brown has repeatedly warned that climate policies that raise the price of dirty fossil fuels - including the coal that powers almost 90% of Ohio's electricity needs - may end up disproportionately impacting Ohio and other coal-dependent states. "We need to make climate change work in a way in which ratepayers in Ohio don't get overwhelmed by price increases and manufacturing in our state doesn't go to China," Brown told the Columbus Dispatch last month. That means President Obama's plan to use 80% of cap and trade to fund his middle-class tax cuts will fail the Sherrod Brown Test. The same is clearly true of the Cap and Dividend proposal, which calls for equal per capita dividends for every American and would transfer wealth from carbon intensive states like Ohio to states like California, Vermont and New York. "I support the (overall) Obama budget, but I am concerned about this cap-and-trade money because the burden will come to Ohio and the benefits are spread to 300 million Americans," Brown told the Dispatch. "That part of the budget is not acceptable." As I told Bill Scher in an op ed that just appeared in the Omaha World-Herald (and at Grist online), passing this part of the test will mean that the bulk of carbon revenues must be proportionally returned to the states or regions from which they are generated - both because coal-dependent, Rust Belt states like Ohio have the most to lose from climate policy and because they need the most help. If we want to get the best bang for the carbon buck and want to maximize the economic gains (to pass part one of this test), we should avoid taxpayer rebates or free giveaways to entrenched industries and instead focus on investments that create clean-energy jobs, lower the cost of clean energy, and help make our bottom-line energy bills manageable and stable. "Done right, climate change legislation will improve our nation's competitiveness by creating new jobs and developing new technologies. We must confront the twin challenges of our economy and environment with a robust and thoughtful response. And we must recognize that climate change legislation is an opportunity to rebuild our nation's manufacturing base." Done right, climate policy can actually pass. From St. Louis and Philadelphia, to Columbus and Denver, Focus the Nation's Clean Energy Town Halls bring youth, community members and elected officials together to find clean energy solutions and plan sustained action. Forget Seattle and Berkeley. Move over Portland and Boston. When it comes to deciding America's energy future, it's place like Akron and Pittsburgh, St Louis and Detroit that deserve the spotlight right now. While many leading cities in the traditionally green bastions along America's coasts are showing what's possible, the American 'Heartland' is where the nation's clean energy future must be built. What's more, the Heartland is where the political fate of climate and clean energy legislation being debated in Congress will be decided. It's good timing then that Nationwide Town Halls for Clean Energy Solutions are happening all around our country right now. In community centers, college lecture rooms, and church halls all across the nation this week and last, elected officials from all levels of government are joining young leaders and community members to focus on what it will take to build a clean and prosperous energy economy and tackle climate change. The ongoing Nationwide Town Halls for Clean Energy Solutions are sponsored by the youth-empowerment organization, Focus the Nation, and organized by hundreds of committed community leaders both young and old. Focus the Nation events have been held in over 165 Congressional Districts, including dozens of town halls across Heartland states like Missouri, Pennsylvania, Colorado and Ohio. The nationwide town halls kicked off on Monday, April 13th in Philadelphia, where swing Senator Arlen Specter (R-PA) joined Drexel University students, community members, and business leaders for a discussion on tackling climate change and seizing the opportunities of the new energy economy. Focus the Nation paid particular attention to members of Congress like Senator Specter, who still need to be convinced to back strong climate and clean energy legislation. The town hall events engaged 24 of these swing senators and representatives, mostly from Heartland states, according to Focus the Nation's civic engagement director, Alex Tinker. "It's usually our leaders who call town halls on pressing issues," said Lindsey Berger, a student organizer of a clean energy town hall hosted in Springfield, Missouri last Friday featuring State Representative Sarah Lampe and local elected officials. "Well this time we're inviting them to our town halls because our generation knows we don't have time to wait to build a clean energy future." The event in Springfield brought students from across the Show-Me State together. "A lot of us, a great combination of college students from across Missouri who rallied together at Power Shift 2009 in Washington DC, worked together to put together this big statewide town hall in Springfield," Berger explains. Across the state in St. Louis on Saturday, another Clean Energy Town Hall kicked off, featuring State Senator Jeff Smith and a representative of U.S. Congressman Russ Carnahan. The event spotlighted local clean energy technology businesses, featured a question and answer forum with elected officials, and concluded with the development of community action plans to help transform St. Louis into a model of the clean energy future. "We set out to find St. Louis businesses that are working in clean energy fields," explains Will Fischer, a student at Washington University and an organizer of the St. Louis town hall. "What we found was a number of small businesses working here to get set up in this new and growing field. This is really exciting because these businesses are working on exactly the kind of solutions we're going to need as a country to build a clean energy economy." Fischer is hoping the new networks WashU students are building with local business and community leaders, and the sustained engagement and activism sparked by the St. Louis town hall, will catch the attention of Missouri Senator Claire McCaskill. McCaskill is a Democrat and a critical swing vote on climate and clean energy legislation this year. "This can't just be one event," Fichser says passionately, "It needs to be the start of a collective, organized, and motivating movement." Focus the Nation's Alex Tinker echoes that sentiment, saying, "It's really what comes next that's most exciting." "Focus the Nation Town Halls are catalysts for action," Tinker explains. "Organizers and participants will begin charting community action plans unique to their locality and will implement them with Focus the Nation's support over the coming year." The community action plans will focus on overcoming roadblocks, sharing solutions from other regions of the country, and identifying opportunities to accelerate momentum along the path to a clean energy economy. In Denver, Colorado, Eric Kornacki is helping organize a town hall event that will bring together college students as well as a diverse cross-section of Denver's communities, for a true multicultural event. This recent graduate of the University of Denver says the community is planning to regroup at a follow up event in October to gauge progress on the action plans they will draft at the town hall, chart next steps, and continue a dialog with elected officials. "I think that this forum for dialog is so unique and it's really urgent right now, particularly in Colorado," Kornacki says. He's right. In Colorado and Ohio, Pennsylvania and Missouri, and states all across the American Heartland, it's exactly these kinds of conversations about clean energy solutions that are so urgent. Led by committed and energized young leaders like Kornacki, Berger, and Fischer, the nationwide Focus the Nation town halls are just the beginning of the clean energy revolution that must quickly sweep across the United States and help catapult the nation into a clean and prosperous energy future. Jesse Jenkins is the founder and chief editor of WattHead - Energy News and Commentary and regularly writes for the Energy Collective, ItsGettingHotInHere.org and the Huffington Post. He is also a board member of Focus the Nation. Guest post from Congresswoman Doris Matsui. Cross-posted from www.focusthenation.org. As a member of the House of Representatives' Energy and Commerce Committee, I just wanted to take a moment out of the hearings we are holding today to discuss the comprehensive climate change bill, and give you a quick update about what is happening here in Washington. In the last few days alone, more action has been taken on climate change than in the entire eight years of the Bush presidency. On Friday, the Environmental Protection Agency (EPA) announced the findings of their scientific review, which recognized that global warming threatens both public health and public welfare, and that greenhouse gas emissions are influencing everything from crop failures to more intense heat waves that we are seeing in my hometown of Sacramento. Yesterday, we started hearings in the Energy and Commerce Committee on the comprehensive climate legislation put forth by Chairmen Henry Waxman and Edward Markey. When passed, the American Clean Energy and Security Act will allow our children and grandchildren to live in a country that is more sustainable, more economically viable, and more efficient than the country we live in today. Today we are celebrating the 39th annual Earth Day, a worldwide celebration designed to inspire awareness and appreciation for the Earth's environment and educating individuals about what they can do to help. And this weekend, I will be one of hundreds of Californians participating in some way at the California Student Sustainability Coalition Spring Convergence & Focus the Nation Town Hall in San Lois Obispo. We are closer to making real progress on climate change legislation that ever before, and I hope we all take this opportunity to make this an historic Earth Day. Six individuals one from each continent (two from Suriname this year), are selected annually to receive the Goldman Prize, a prestigious, international award for excellence in environmental activism. And once a year, thousands of people from all around the world descend upon San Francisco to recognize these fierce and effective environmental activists. The ACE team was lucky enough to attend this event last night, and also meet with environmentally-minded youth from around the Bay Area and beyond. As we exited BART and headed toward the city center, it became immediately clear that this was no ordinary Monday. Thousands of excited-looking people made their way through the muggy heat and into the Opera House. Up in the balcony, we were amazed to see over five hundred enthusiastic youth settling in for an evening of powerful storytelling, beginning with an in-person hello from Al Gore and Robert Redford. The winning activists have worked tirelessly over the years, and against incredible odds. Their lives have been threatened, and they have been subject to a great deal of hardship. But the results they have achieved for their communities, and for future generations, are simply enormous. The night began with the story of the winner from North America, Maria Gunnoe. While Gunnoe wasn’t born an “environmental activist,” she was quick to realize the environmental injustices in her community due to coal mining. She hails from Boone County, West Virginia - the heart of coal country. A 1,200-acre mountaintop removal mine began on the ridge above her home. 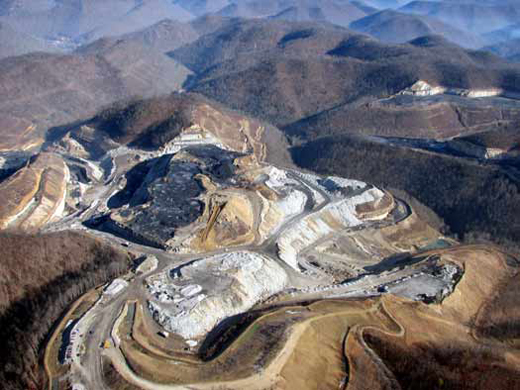 Here's what "mountaintop removal" looks like. Mountain tops are literally blown off. And today, her house sits directly below a 10-story valley fill that contains two toxic ponds of mine waste comprised of run-off from the mine. Check out her video for the full story on this heartbreaking environmental damage. Maria Gunnoe decided enough was enough. She began organizing against coal mining and the powerful corporate interests that threaten her community’s relationship to the land. She provided grassroots trainings and has encouraged residents to speak out during hearings on mountaintop removal. In 2007, she helped win a lawsuit against the Army Corps of Engineers. The lawsuit repealed mountaintop removal valley fill permits in southern West Virginia granted without environmental consideration, and banned new permits. She also worked to stop the valley fill projects right above her home, ones the lawsuit did not prevent. Coal miners and corporate interests harass Gunnoe regularly as a result of her work. But she is not giving in, and is now working to help pass the Clean Water Restoration Act. Other winners included Marc Ona Essangui of Gabon, Rizwana Hasan of Bangladesh, Olga Speranskaya of Moscow, Yuyun Ismawati of Indonesia, and Wanze Eduards and Hugo Jabini of Suriname. Their stories are just as powerful as Maria Gunnoe's, and their actions weave together a fabric of global environmental stewardship. The stories of the Goldman Prize winners put our work here at ACE into perspective. While the winners may be older, the message of their work transcends any boundaries of age, geography, race, gender, and so on: individuals can have an enormous impact. And this central message is what ACE is all about. As the House Energy & Commerce Committee prepares to vote on a comprehensive clean energy plan, the League of Conservation Voters launched a pre-emptive campaign against Rep. Roy Blunt for his stated opposition to the bill, which would build an American clean energy economy. The nonpartisan campaign is built around a hard-hitting TV ad, “Believe,” which urges people to call on Rep. Blunt to believe in America and our history as a “can-do” nation again. “Rep Blunt is siding with Big Oil and saying no to millions of new clean energy jobs, and no to making America a global leader on energy. Why does he seem to have so little faith in American ingenuity and know-how?” said Gene Karpinski, President of the League of Conservation Voters. In addition to the TV ad, which will air across Missouri and heavily in the Springfield media market, LCV also launched online ads and a direct mail program to ensure that Missourians know that Rep. Blunt is opposed to creating good, American jobs in a clean, American energy sector. Rep. Blunt is a member of the House Subcommittee on Energy & Environment, which is set to vote on The American Clean Energy & Security Act next week. Rep. Blunt released a statement on April 2, dismissing the bill despite numerous analyses showing that building a clean energy economy will create millions of new jobs. The “Believe” campaign is part of a nonpartisan effort to encourage key Members of the Energy and Commerce committee to pass a comprehensive clean energy and global warming bill in the next few weeks. LCV has created websites focusing on both Democratic and Republican Members of the committee, to highlight each Representative’s actions and statements during the debate on this bill. The full script for “Believe” is below. America is a can-do country. We can create millions of new clean energy jobs and become a global leader in energy technology. But Roy Blunt says no. No to clean energy. No to millions of new jobs. At the same time, Blunt has taken hundreds of thousands of dollars from Big Oil – and voted to hold America back. Call Roy Blunt and tell him it’s time to start believing in America again. By Rachel Barge. This article is cross-posted at SolveClimate.com; see original article here. At 648 pages, the "discussion draft" of the Waxman-Markey climate bill is a behemoth – I’d personally rather walk on hot coals than have to synthesize that beast. But the endless page-count and dry legal jargon isn’t stopping young climate advocates from reading every inch, nor promptly picking it apart. To get a handle on what they're thinking, and how their congressional “asks” differ from colleagues one generation removed, I talked with a number of young climate policy experts intimately familiar with the Waxman-Markey legislation. I wanted to understand their take on the bill, the political war-zone it has to fight through, and where they see young people contributing in the policy debate. The loudest message I got was that our nation's savviest young climate advocates are calling for a complete reframing of the climate debate, in two major ways. The first deals with rhetoric around the cost of the policy. When Republicans say, “It costs too much,” and Democrats respond with, “We’ll make it cost less,” they’ve already lost the argument. The debate needs to be around “how much it can help” – how much will it stimulate the economy, how many jobs will it create, how secure will it make us, etc. And inversely – how much will a weak bill, or inaction, cost us? The second framing critique deals with the climate movement’s unfortunately schizophrenic disconnect between our messaging and our policy prescription. For years, we’ve been hammering the following point: climate change = red alert global catastrophe, it threatens all life on Earth and the future habitability of our planet. Yet our policy solution is nowhere near the red alert level, it lies somewhere between Velveeta cheese and Taco Bell hot sauce in terms of punch. By asking for slow-moving emissions reductions targets far into the future, we’re sending a completely inappropriate and ultimately disempowering message for our cause – that solving climate change isn’t urgent, we’ll deal with it sometime later, and it won’t require much change from the status quo since we’ll transition so gradually. Two percent reductions per year – easy, right? Wrong, say young advocates, whose personal future is at stake. We’ve got to go full steam ahead and transition off carbon fuels as fast as possible, with our goal not 80% by 2050 but “maximum effort”, as Holmes Hummel likes to describe. And because this bill appears to be our only shot at climate legislation this year, youth are in no position to compromise. Beyond framing, young folks want carbon dollars flowing into clean tech RDD&D, green jobs corps, and a portion into citizen’s hands to counter persistent Republican tantrums about increased energy costs (which GOP leaders shamefully exaggerated earlier this month). What they don’t want is money and policy perks flowing to float the dirty energy industry – and they’re outraged that the bill is chalk full of them. I’ll let their stories speak for themselves. Jesse Jenkins, 25, is director of energy and climate policy at the Breakthrough Institute. He’s been shouting the weak points of the bill over public radio and on web, and fears that without a clear focus on where the carbon dollars are going, the legislation will be prone to Republican attacks. In the recession’s economic climate, justifiable concerns about job security and costs of living amplify the effects of such attacks, and Jenkins says, could spell doom for effective legislation on carbon emissions. That concern is echoed by Craig Altemose, a former executive committee member of the Sierra Student Coalition and now a student at Harvard Law School and the Kennedy School of Government. Altemose, 25, contends that an effective bill should rival the economic stimulus package in both size and scope. “We should invest hundreds of billions of dollars into solving the climate crisis—now,” he says. A politically viable and environmentally responsible bill must recognize the economic imperative for jobs and the global urgency for climate action, he says, and connect them through a transformation to a clean energy economy. Altemose also claims the current paradigm of emissions reduction policy betrays the urgency of the problem - by focusing on far-off targets like 80% by 2050, rather than the immediate action needed. “After 9/11, did anyone go on TV and suggest we should try to reduce the number of terrorists 20% over the next 11 years, and 80% over the next 40 years? Or did we say that we needed to hunt down and catch every single terrorist as quickly as possible? Richard Graves, the 27-year-old director of Fired Up Media, worries that the bill’s impact on state-level efficiency standards is being overlooked. The massive gains in efficiency and renewable energy standards that California pioneered, for example, would be squelched for future progressive states under the current version of the bill. Whether that’s a viable strategy is hard to predict – if the pendulum swings back towards the Republican side in 2010, beefing up the bill could be nearly impossible. The deficiencies in the current legislation are even more problematic considering that the bill will be subject to a rough and tumble Senate debate, where Republicans will lob attacks regarding supposed economic harm inflicted by climate change legislation. Jenkins asserts that compromises to the legislation are inevitable, likely resulting in lower, less effective carbon prices and emissions reductions. A bill without high enough carbon prices would be one without teeth – it will leave the U.S. without an effective emissions-reduction policy while simultaneously missing the opportunity to use the bill as a jumper cable for the clean energy economy. “Because the bill is currently structured around emissions reductions rather than investment in a clean energy economy, the reductions targets seem to be the most powerful force in the bill. However, these targets are not adequate for the level of reductions needed. Another sore point is that the legislation is already “bloated with concessions to carbon-based industry”, including heavily use of carbon offsets, Jenkins says. With the future habitability of the planet in the balance, young people don’t feel that these questionable credits should be given out so easily. Additionally, the $10 billion investment in carbon-capture and storage technology feels like a slap in the face to most activists, and indicative of the coal lobby’s thirst for dollars to provide life support for the dirty energy status quo. Since dirty energy companies and special interests will assuredly petition for most auction permits to be given out for free in order to float their industry, young folks are worried that concessions to these interests will hamper the ultimate goal of the legislation – fast emissions reductions and a transition to a clean energy economy. John Landefeld, a 24-year-old researcher at the Harvard School of Public Health, believes that instead of reducing the efficacy of carbon pricing legislation by redistributing the proceeds to an already monopolistic and powerful dirty energy industry, lawmakers should instead explicitly pledge auction revenue towards tech investment to spur a clean energy renaissance.